The Ramet Air Pant has a durable, multi-panel construction which features strategically positioned PU reinforcements for abrasion resistance. A full mesh liner and the Jet Ventilation System air intakes offer cooling airflow while stretch inserts aid mobility and comfort. Multi-panel construction featuring 450/600 denier panels with strategically positioned abrasion resistant Air-Flow mesh for optimized cooling comfort. Outer shell reinforced with PU coating for improved durability, plus main seam construction for maximum tear resistance. Accordion textile stretch inserts on back and knees for excellent levels of maneuverability and fatigue reduction. Removable hip foam padding with velcro attachment for secure, safe fit. 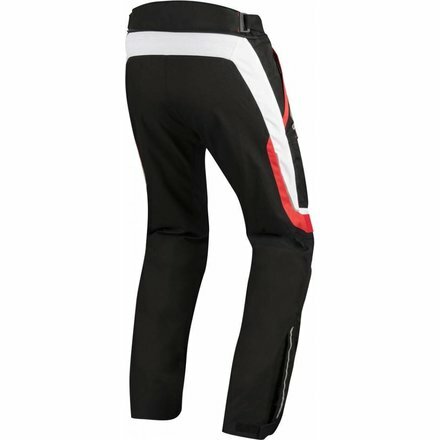 Zippered and velcro gusseted lower hem ensures tight and personalized closing of pant around boot. Full mesh lining and 3D mesh on interior waist for comfort and breathability. External zippered pockets on thighs for safe, peace-of-mind storage. Jet Ventilation System (JVS) features zippered, mesh backed air ventilation intakes for controllable levels of cooling airflow. Pre-curved shaping for natural riding position reduces fatigue while improving comfort. D-ring adjustable waist for a secure and personalized fit. Removable, CE approved knee and tibia protectors for class-leading safety. 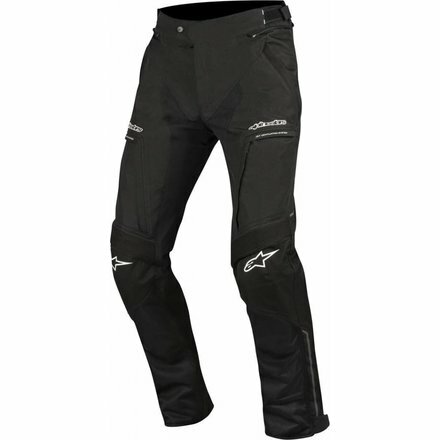 Waist zipper allows connection to Alpinestars leather and textile jackets.